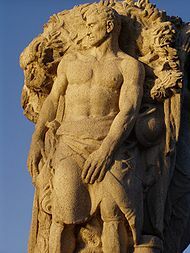 James Earle Fraser (November 4, 1876 – October 11, 1953) was an American sculptor during the first half of the 20th century. His work is integral to many of Washington, D.C.'s most iconic structures. Fraser was born in Winona, Minnesota. His father, Thomas Fraser, was an engineer who worked for railroad companies as they expanded across the American West. A few months before his son was born, Thomas Fraser was one of a group of men sent to recover the remains of the 7th Cavalry Regiment following George Armstrong Custer's disastrous engagement with the Lakota, Cheyenne, and Arapaho forces at the Battle of the Little Bighorn. As a child, James Fraser was exposed to frontier life and the experience of Native Americans, who were being pushed ever further west or confined to Indian reservations. These early memories were expressed in many of his works, from his earlier trials, such as the bust Indian Princess, to his most famous projects, such as End of the Trail and the Indian Head (Buffalo) nickel. Fraser began carving figures from pieces of limestone scavenged from a stone quarry close to his home near Mitchell, South Dakota in early life. He attended classes at The School of The Art Institute of Chicago in 1890 and studied at the École des Beaux Arts and the Académie Julian in Paris in the late 19th century. Early in his career, Fraser served as an assistant to Richard Bock and Augustus Saint-Gaudens; he formed his own studio in 1902. He also taught at the Art Students League in New York City beginning in 1906, and later became its director. Among his earliest works were sculptural pieces at the World's Columbian Exposition of 1893 and, for the 1915 Panama–Pacific International Exposition in San Francisco, one of his most famous pieces, End of the Trail. While it was meant to be cast in bronze, material shortages due to World War I prevented this. After the Exposition, the original plaster statue was moved to Mooney's Grove Park in Visalia, CA. Exposed to the elements, it slowly deteriorated until it was obtained by the National Cowboy & Western Heritage Museum in 1968 and restored. The restored statue is currently on display in the entryway of the Oklahoma City museum, and the original that sat in Visalia, CA, was replaced with a bronze replica. The original bronze replica statue of the End of the Trail Statue is located in Shaler Park, in Waupun, Wisconsin. The statue was purchased by inventor and sculptor, Clarence Addison Shaler, and donated to the City of Waupun on June 23, 1929. Fraser's work in Washington includes The Authority of Law and The Contemplation of Justice at the U.S. Supreme Court; the south pediment and statues at the National Archives; Alexander Hamilton and Albert Gallatin at the U.S. Treasury; and the Second Division Monument, completed with the firm of architect John Russell Pope. His commissions also include coins and medals, such as the World War I Victory Medal, the Navy Cross, and the Indian Head (Buffalo) nickel. This coin was discontinued after 1938, but has since been reprised in 2001 on a US commemorative coin, and more recently on a gold buffalo one ounce gold bullion coin. Fraser’s major works include two heroic bronze equestrian statues titled The Arts of Peace, designed for the entrance to the Rock Creek and Potomac Parkway, behind the Lincoln Memorial. The pair was a companion to sculptor Leo Friedlander's The Arts of War, installed immediately to the south at the east end of Arlington Memorial Bridge. The groups had been designed in the 1930s but were not cast until the 1950s, because of a shortage of metals during World War II. Fraser was a member of the National Academy of Design, the National Sculpture Society, and the Architectural League of New York. His numerous awards and honors include election to the National Institute of Arts and Letters and gold medal from the Architectural League in 1925. He served on the U.S. Commission of Fine Arts in Washington, D.C., from 1920 to 1925. Muralist Barry Faulkner, a friend of Fraser’s from their days in Paris together described Fraser like this: "His character was like a good piece of Scotch tweed, handsome, durable and warm." [see Wilkonson, References] Fraser's papers and those of his wife, sculptor Laura Gardin Fraser, are held at the Special Collections Research Center at Syracuse University Library, the Smithsonian Archives of American Art, and the National Cowboy & Western Heritage Museum. James Earle Fraser died on October 11, 1953, at Westport, Connecticut, and is buried in Willowbrook Cemetery. Second Division Memorial, The Ellipse, Washington, D.C.
Frederick Keep Monument. Rock Creek Cemetery, Washington, D.C.
Albert Gallatin monument, United States Treasury, Washington, D.C.
Alexander Hamilton monument, United States Treasury, Washington, D.C. Recorder of the Archive, Pediment of National Archives and Records Administration Building, Washington D.C.
Guardianship sculpture, National Archives and Records Administration Building, Washington D.C.
Heritage sculpture, National Archives and Records Administration Building, Washington D.C.
Contemplation of Justice, United States Supreme Court Building, Washington, D.C.
Authority of Law, United States Supreme Court Building, Washington, D.C.
1911 Frederick Keep Monument, Rock Creek Cemetery, Washington, D.C.
1923 Alexander Hamilton, Treasury Building, Washington, D.C.
1926 John Ericsson National Memorial, East Potomac Park, Washington, D.C.
1936 Second Division Memorial, The Ellipse, Washington, D.C.
1947 Albert Gallatin, Treasury Building, Washington, D.C.
1951 Music and Harvest, The Arts of Peace, Washington, D.C.
1951 Aspiration and Literature, The Arts of Peace, Washington, D.C.
1932 William Howard Taft Monument, Arlington National Cemetery, Washington, D.C.
1934 Pediments for the Department of Commerce Building, Washington, D.C.
1935 Recorder of the Archive (pediment), National Archives Building, Washington, D.C.
1935 Heritage and Guardianship, National Archives Building, Washington, D.C.
1935 Contemplation of Justice and Authority of Law, United States Supreme Court Building, Washington, D.C.
^ Thomas E. Luebke, ed., Civic Art: A Centennial History of the U.S. Commission of Fine Arts (Washington, D.C.: U.S. Commission of Fine Arts, 2013): Appendix B, p. 544. ^ "James Earle Fraser". Fine Art May 2007. Rago Arts and Auction Center. Archived from the original on 2011-07-15. ^ "Waupun Sculptures". Waupun-wisconsin.com. 1929-06-23. Retrieved 2012-03-21. ^ "FRASER". Nationalcowboymuseum.org. Retrieved 2012-03-21. ^ James Earle Fraser in: Dakota Discovery Museum, retrieved 21 March 2014. ^ "Arts of War and Peace". JGWA Architects. 1951-09-26. Retrieved 2012-03-21. Wikimedia Commons has media related to James Earle Fraser. Daniel Chester French, one of the most prolific and acclaimed American sculptors of the late nineteenth and early twentieth centuries, is best known for his design of the monumental statue of Abraham Lincoln (1920) in the Lincoln Memorial, Washington, DC. Felix Weihs de Weldon was an Austrian-born American sculptor. His most famous pieces include the United States Marine Corps War Memorial in Arlington County, Virginia and the Malaysian National Monument (1966) in Kuala Lumpur. Edward Clark Potter was an American sculptor best known for his equestrian and animal statues. His most famous works are the marble lions, nicknamed Patience and Fortitude, in front of the New York Public Library. Henry Bacon was an American Beaux-Arts architect who is best remembered for the Lincoln Memorial in Washington, D.C., which was his final project. Carl Paul Jennewein was a German-born American sculptor. Leo Friedlander was an American sculptor, who has made several prominent works. Friedlander studied at the Art Students League in New York City, the Ecole des Beaux Arts in Brussels and Paris, and the American Academy in Rome. He was an assistant to the sculptor Paul Manship and taught at the American Academy in Rome and at New York University, where he headed the sculpture department. He was also president of the National Sculpture Society. In 1936, he was elected into the National Academy of Design as an Associate member, and became a full Academician in 1949. John Quincy Adams Ward was an American sculptor, who may be most familiar for his larger than lifesize standing statue of George Washington on the steps of Federal Hall National Memorial in New York City. There are many outdoor sculptures in Washington, D.C. In addition to the capital's most famous monuments and memorials, many figures recognized as national heroes have been posthumously awarded with his or her own statue in a park or public square. Some figures appear on several statues: Abraham Lincoln, for example, has at least three likenesses, including those at the Lincoln Memorial, in Lincoln Park, and the old Superior Court of the District of Columbia. A number of international figures, such as Mohandas Gandhi, have also been immortalized with statues. The Statue of Freedom is a 19½-foot tall allegorical statue that rests atop the United States Capitol dome. Hermon Atkins MacNeil was an American sculptor born in Everett, Massachusetts. He is known for designing the Standing Liberty quarter, and for sculpting Justice, the Guardian of Liberty on the east pediment of the United States Supreme Court building. Robert Ingersoll Aitken was an American sculptor. Walker Kirtland Hancock was an American sculptor and teacher. 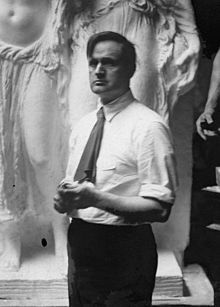 He created notable monumental sculptures, including the Pennsylvania Railroad World War II Memorial (1950–52) at 30th Street Station in Philadelphia, Pennsylvania, and the World War I Soldiers' Memorial (1936–38) in St. Louis, Missouri. He made major additions to the National Cathedral in Washington, DC, including Christ in Majesty (1972), the bas relief over the High Altar. Works by him are at the United States Military Academy, the Library of Congress, the United States Supreme Court Building, and the United States Capitol. Wheeler Williams was an American sculptor, born in Chicago, Illinois. 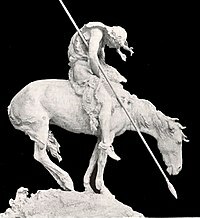 Carl Wilhelm Daniel Rohl-Smith was a Danish American sculptor who was active in Europe and the United States from 1870 to 1900. He sculpted a number of life-size and small bronzes based on Greco-Roman mythological themes in Europe as well as a wide number of bas-reliefs, busts, funerary monuments, and statues throughout Denmark, the German Confederation, and Italy. Emigrating to the United States in 1886, he once more produced a number of sculptures for private citizens. His most noted American works were a statue of a soldier for a Battle of the Alamo memorial in Texas, a statue of Benjamin Franklin for the World's Columbian Exposition in 1893, a statue group in Chicago commemorating the Fort Dearborn Massacre, and the General William Tecumseh Sherman Monument in Washington, D.C. The Harvey S. Firestone Memorial is a large sculpture ensemble dedicated to Harvey Firestone, created by sculptors James Earle Fraser and Donald De Lue in Akron, Ohio. The monument was designed by architect Eric Gugler and was dedicated on August 3, 1950. It is located at Bridgestone Firestone Inc., 10 E Firestone Blvd, Akron, OH 44301, adjacent to the Research Building. Eric Gugler was an American Neoclassical architect, interior designer, sculptor and muralist. He was selected by President Franklin D. Roosevelt to design the Oval Office.